The AeroPress is a device for brewing coffee. It was invented in 2005 by Aerobie president Alan Adler. Coffee is steeped for 10–50 seconds (depending on grind and preferred strength) and then forced through a filter by pressing the plunger through the tube. The filters used are either the AeroPress paper filters or disc shaped thin metal filters. The maker describes the result as an espresso strength concentration of coffee, but its most frequent use is more in the filter brew strength. The device consists of two nesting cylinders. One cylinder has a flexible airtight seal and fits inside the larger cylinder, similar to a syringe. The cylinders are moulded of polypropylene, tinted a grey colour. The first Aeropress were moulded of clear polycarbonate, then later of copolyester, clear and later tinted. AeroPress switched to copolyester in 2009 because unlike polycarbonate, copolyester does not contain BPA. To reassure customers still using the original models, they also claim testing they performed showed no leaching of into brewed coffee from the polycarbonate. According to the instructions, fine-ground coffee is placed in the bottom of the larger cylinder on top of a paper microfilter. Hot water at approximately 79 or 85 °C (175 or 185 °F) is then poured over the coffee; this mixture is stirred for approximately 10 seconds before being forced through the microfilter by pushing the plunger downwards. In the different coffee competitions worldwide (World Barista Championship, Brewers Cup, etc. ), the coffee is more often ground slightly finer than 'filter grind', and the dose is between 14 and 20 g (0.49 and 0.71 oz), with about 200 to 230 ml (7.0 to 8.1 imp fl oz; 6.8 to 7.8 US fl oz) of water at 80 to 92 °C (176 to 198 °F) and a steeping time of 30 to 60 seconds. 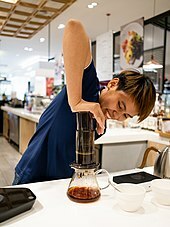 Baristas and coffee drinkers have also developed methods of brewing using an inverted (upside-down) AeroPress. In inverted brewing, the plunger is placed into the column from the beginning, close to the "top" of the column, and the entire AeroPress stands upside-down, resting on the top of the plunger. One or two scoops of ground coffee are added, followed by water, and the entire mixture then stirred. While that brews, a filter is placed into the filter cap and moistened to help it stick in place then the AeroPress cap is placed on top of the column and screwed into place. Lastly, once the desired brewing time is complete the AeroPress is either turned right-side-up and plunged normally or held at an angle and plunged horizontally. This method is more similar to the French press, particularly the extended brewing time in which the grounds and water sit together. This makes it useful for using grinds that wouldn't be optimal in the official method such as coarse grinds that might be used in a French press. Uses a disposable paper filter which removes most of the coffee solids (a French press uses a coarser wire or nylon mesh filter). However, several third-party reusable metal filters are available. Uses air pressure to extract flavour. Aerobie does not recommend reusable mesh filters, saying that coffee made with paper filters has tested better for taste. Aerobie does approve of rinsing, drying, and re-using the standard paper filters. ^ "Micro-fine Stainless Steel Coffee Filter". ^ "Metal Fabric Filter for the Aeropress Coffee Maker". ^ "World Aeropress Championship Recipes". ^ "FAQs for the AeroPress® Coffee Maker". aerobie.com. Retrieved 25 December 2015. ^ "Aeropress story". aerobie.com. Archived from the original on 19 October 2013. ^ "Aeropress Champion Marie Hagemeister's Winning Brew Method". Sprudge. 2010-07-02. Retrieved 2011-01-16. ^ "Brew Methods". Archived from the original on 5 February 2011. Retrieved 2011-01-16. ^ "Do you recommend using a metal filter in the AeroPress?". AeroPress. Aerobie.